The fantastic thing about Blu-ray is the magical ability it has to make almost any film look like a stunning masterpiece – from Howard the Duck to my colonoscopy. Now when a film like Disney’s Earth comes along, with awe-inspiring cinematography of vast panoramic landscapes, the home theater experience is simply breath-taking. If you have seen the BBC series Planet Earth, then this Earth may seem quite familiar. Disney Nature took that concept and turned it into a feature length documentary featuring narration by James Earl Jones instead of some intellectually annoying Brit and also made sure to water down the depressingly dire ecological message of the BBC series into a much cuter, family friendly film. There is not much of a story, but the film does provide plenty of footage of adorable polar bear cubs fumbling over the vast Artic tundra and baby elephants following their mothers across the Kalihari desert. The film follows three animal families, but the emotion and drama is superficial at best and the science and ecology presented in the film is not only shallow but outdated. It is old news that the rain forests are drying up and yet its presented here as breaking news. Is this film another ‘March of the Penguins’ as so much of the hype machine wants us to believe? Not by a longshot. ‘Penguins’ had a moving story that brought people like my father, a normally stoic construction worker and Vietnam vet, to tears. And it gave us insight into a part of nature few of us had ever seen before. Disney will have to do a lot more soul searching to recreate a masterpiece like that. 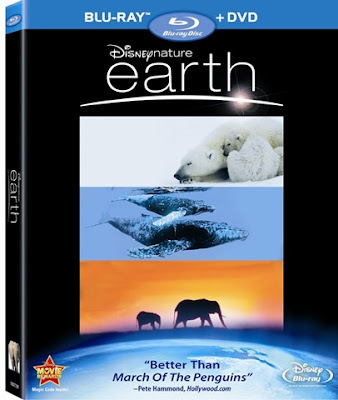 Overall, I would recommend Disney ‘Earth’ for its visuals and the few rare moments when despite the poor script and out-dated ecology, the heavenly images of our planet evoke a sense of awe and concern for the creatures and the precious, fragile planet we share together.